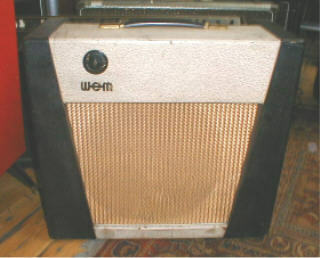 c1963 Watkins Warrior, courtesy of Music Ground, Leeds, England. Another short-lived and hence rare model, the Warrior Bass shares the cosmetics of the Scout and seems to have been introduced circa 1962/63 in a black/cream two-tone covering. It falls into the period when Watkins were changing into Wem. Some have brass Watkins logos, some have the later "day-glo" orange Wem logo. Extinct by 1964, no known successor.